Create a backyard destination for parties, family gatherings, a picnic table, a porch swing or two, hammocks, and other outdoor furniture. Perfect for your patio, deck, or outdoor kitchen! Standard sizes ranging from 8x8 to 14x26. Pavilions are available assembled and ready to use or in kit form with directions. 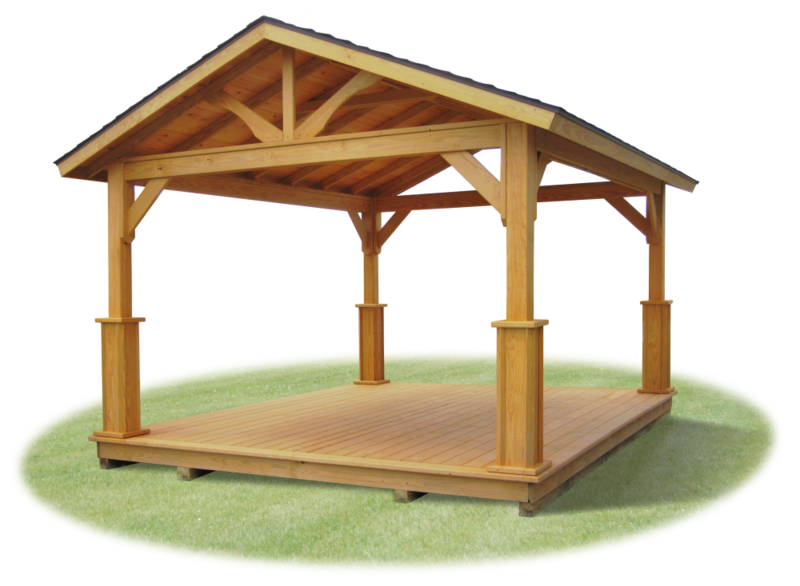 Pavilions come unstained standard, but we also offer 4 stain options. 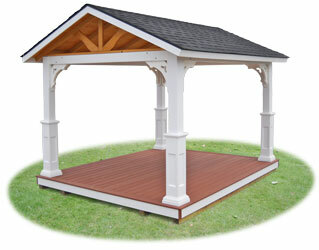 We can also custom stain a pavilion to your specifications. There's a variety of lifetime asphalt shingle colors to choose from (including dark brown, black, dark or light grey, green, red blue, and more). 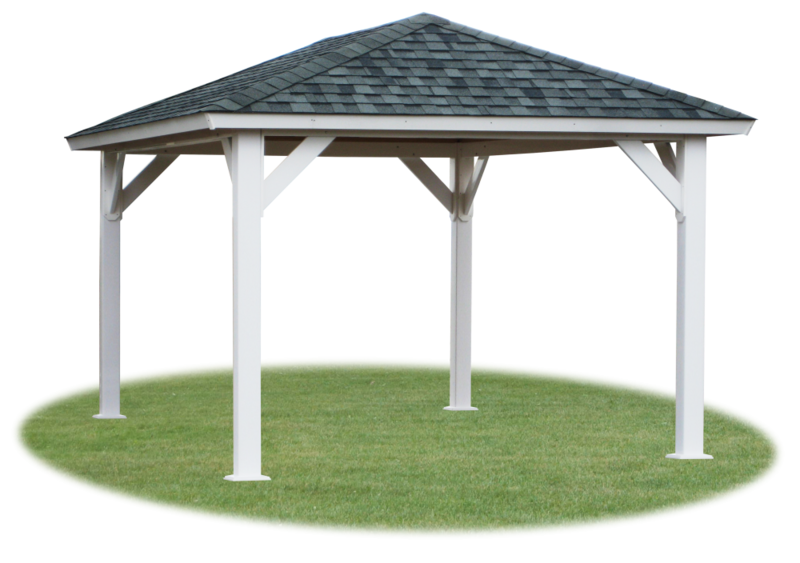 Wood and Vinyl cupolas are also available. Steel tie down plates are also available for anchoring your pavilion to your deck or patio. 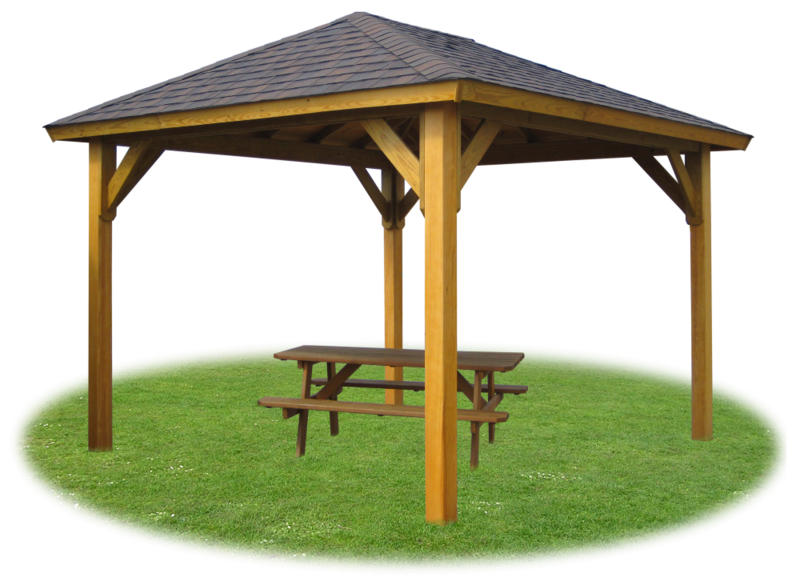 Our wood pavilions are made from the best pressure treated yellow pine available. All lumber is milled in shop and hand graded so we can provide a structure with the best appearance and structural integrity possible. We use laminated 6x6 posts designed to resist warping, 2x6 braces, and 2x6 headers and top plates. Our roofs are constructed with 2x4 rafters spaced 24" on center and topped with a beautiful 1x8 tongue and grove white pine board, which can be stained if desired. Choose between a standard roof or one with open gable ends. Wood pavilion shown with standard posts and floor. Outdoor patio furniture available for addition cost. Wood pavilion shown with standard posts, and no floor. Picnic table (and other outdoor furniture) available for addition cost. Wood pavilion shown with gold stain, savannah posts, open gable ends, weatherwood shingles, and floor. 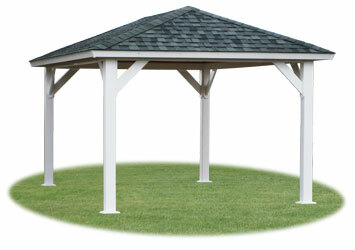 Our vinyl pavilions are made from the #1 hand selected, pressure treated lumber, covered in low-maintenance vinyl. 6x6 posts are sleeved with vinyl. Our roofs are constructed with 2x4 rafters spaced 24" on center and topped with a beautiful 1x8 tongue and grove white pine board, which can be stained if desired. Choose between a standard roof or one with open gable ends. Vinyl pavilion shown with standard posts, dark grey shingles, and no floor. Vinyl pavilion shown with open gable ends with Gold stain, savannah posts, black shingles, and chestnut floor. How many people can I fit in my pavilion? A good rule of thumb is to allow 20 square feet per person. For example: A 10' x 12' pavilion is 120 square feet, which is enough room to comfortably fit 6. Vinyl or Wood? What do you recommend? 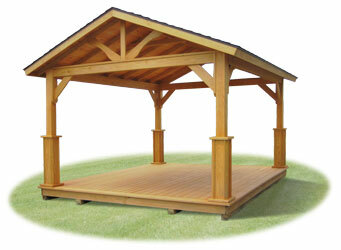 Wood pavilions can blend into almost any setting; from rustic to elegant. 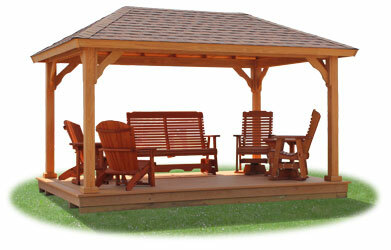 Wood pavilions can be stained to closely match any color scheme and can even be changed to different colors. Wood is very durable. It gives a unique look and warm feeling that other products just can’t match. Vinyl has that finished look that you just can’t get from wood. It will keep it’s color practically forever! Vinyl pavilions are very low maintenance… just wash it off when dirty! Plus, you don’t have to worry about vinyl splitting or cracking over time. In the end it’s about choosing the product that best fits your needs and the look you want for your backyard! If I choose a wood pavilion, is there maintenance involved? 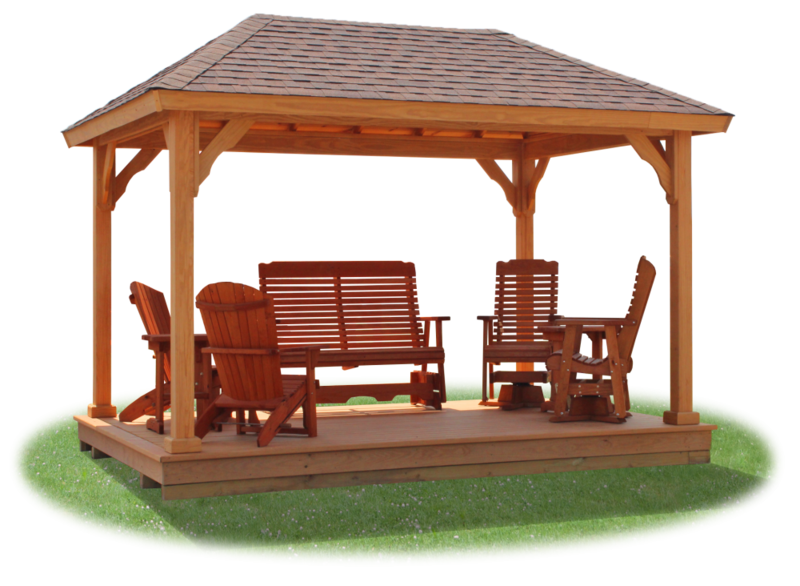 Wood pavilions may require maintenance depending on how you’d like your pavilion to look over time. We use #1 pressure treated yellow pine that has been kiln dried. This means we can immediately stain your pavilion or you can let it unstained and start to age. If you choose an unstained pavilion, the wood will naturally weather to a silvery gray color. 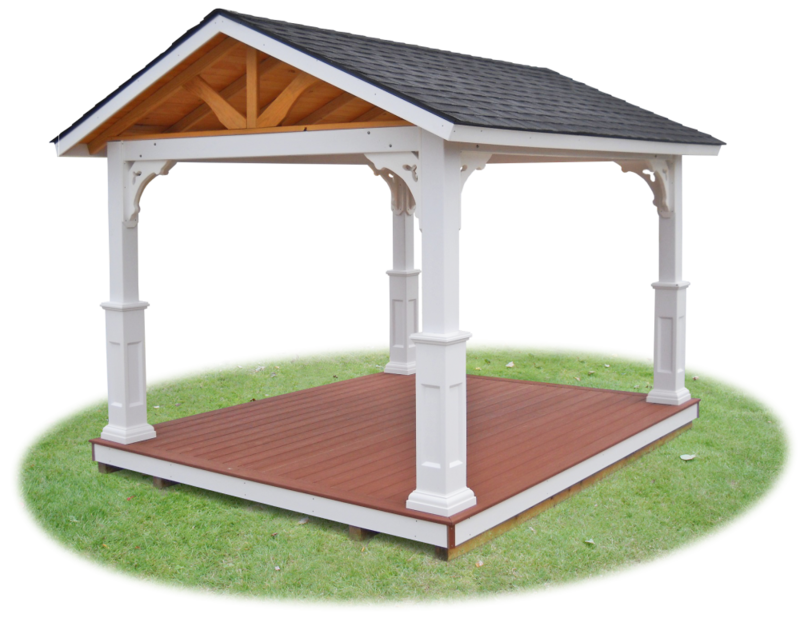 If you choose a stained pavilion and want it to maintain it’s color, it is important to re-stain every few years to keep a beautiful ‘like new’ color for years to come. Can I buy a pavilion and assemble it myself? Of course! 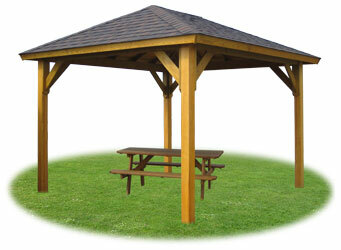 We sell pavilions that are fully assembled and ready to use OR kits with directions. Just let us know if you’d like to pick it up at the sales lot or have it delivered to your home.